Few would deny today’s performance at Ibrox was a higher-intensity, more energetic endeavour than has mostly been seen this season. While the play on offer was far from the very best we saw Warbs’ Rangers produce last season, it was probably the best display his men have put in this competitive season. And yet, the same old outcome undermined any progress anyone might think had been made since the debacle at Parkhead. The truth is, ever since Dumbarton nearly took a point at Cheaper Insurance Direct Stadium on September 19th last year, teams have learned how to handle Warburton and his tactics. The signs were glaring a year ago that even a poor Dumbarton team was wise to Warbs’ possession tactics and knew that sitting in, suffocating and countering was the way to go about dealing with them, and it took a magnificent solo 25-yard finish from Waghorn to finally put Dumbarton away that day. 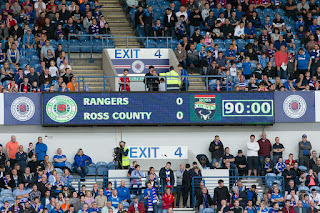 Three days later St Johnstone came to Ibrox and tore the system apart bare. Ever since then, while Rangers still managed to secure the title, the best teams learned quickly how to deal with Rangers – with varying levels of success. And that has worryingly carried over to this season, with better teams being wise from the off to Warburton, rather than the unknown quantity he initially was last season. Today’s output saw some neat play in midfield, with a welcome return from Holt, and a more reliable defence with no sign, thankfully, of Kiernan. But up front saw the same old stodgy profligacy with huffing and puffing but no blowing of any houses down. 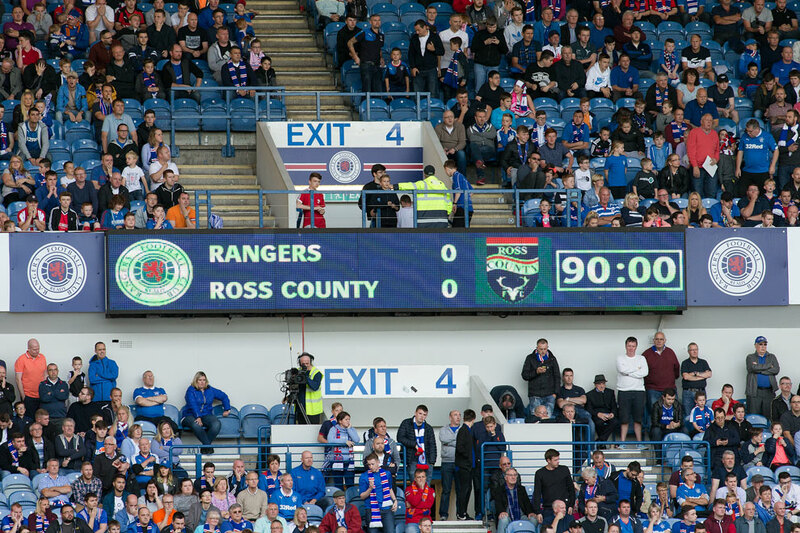 Rangers seem to take chisels to boulders and wonder why the boulder doesn’t crack into pieces; chiselling is not working, and while County’s early season position is probably flattering, they worked hard to earn their point today, exposing again Warbs’ inability to alter his system. Do not get me wrong; I am not advocating brute force crude lump play, ala McCoist and Jon Daly. Those days were ugly. But at this higher level, Warbs lack of being able to switch to a different tactic has now cost Rangers 50% of the points on offer this season, which is a painful return. Today we saw a pretty energetic midfield, with Windass in particular having an excellent afternoon, while Holt’s industry has been painfully missed – Barton most certainly was not. And Andy Halliday really did enjoy making a point – while still no natural DM, he played that slot today and appeared more solid in it, having learned the requirements last season. Meanwhile the defence was very solid indeed, with the Hill and Wilson partnership again being the best we have seen this season despite how catastrophically awful the captain was today (and has been this whole season). There is no coincidence Rangers’ best defensive displays this season have been the three matches Rob Kiernan did not play in. And up front? Here is where the problems manifest – McKay is bitterly out of form and just not producing. Either that or he simply is not good enough for this level, while Waghorn was more penetrative but found support lacking, although he nearly scored but for a stunning save. Garner continues to disappoint. Seeing these problems before him, Warburton’s only repertoire is to make 60 minute subs then seethe about bad luck, referee decisions or how his players must learn when said switches do not have the effect he wanted. Or alternatively, as he did today, talk about ifs and buts and say his players played well and the team should have won. There were minute signs of progress, but the harsh truth is Rangers have played three matches at Ibrox in the league this season and only won one. And the proof of the pudding is the points won at the end of the day. Right now Rangers’ form puts them anywhere from fourth to eight in the table going by last season’s final standings. Bring Walter back out of retirement and save the season. Totally agree mate, for me watching this every week, Warburton has been the problem, since as the article says early last season when we had won 11 games on the bounce. He simply has no other ideas, he is so predictable that part times were coming to Ibrox and making us look a poor idealess side and that was last season. Carry that on into this season in the Premier and I'm saddened but not at all shocked by what's happening. Despite all the 'Magic Hat' rhetoric he has nothing to offer in terms of variance of tactics. Rangers at the moment have simply no idea how to attack quickly and incisively, they all want to play a passing game even when it's not what's needed or required to score. It's like this manager believes you'll get 'points for presentation', sorry to tell you mate, you don't. The aim of the game is to get the ball in the net more times than them, possession football is good and has it's place, but you need to do a lot more than that to win games against differing teams week in and week out. Sadly I don't think Warburton (or Weir for that matter) has this response within his experience, why? the evidence since October last year. For a side low on confidence, I thought the boys played well today...at least from what I saw of the highlights. While I'm critical of Warbs too, I do feel sad that the togetherness we all felt last season is not quite there this season. We are, and I include myself in this, judging players too quickly. It's only been 6 games, which is nothing. Give it another 2 or 3 games and I think we'll be back to winning ways on a consistent basis. I don't think Warbs tactics are the problem (are they any different to that of Guardiola or Wenger? )...the problem is he signed way too many new players in one window. And we can hardly blame him for that...we all were crying out for it. The manager is under the cosh lads...he did a lot for our club last season, so let's show him some loyalty. If we're still struggling in Oct/Nov, it's another matter, but I don't think we will be. We'll get better and better. from what you saw of the highlights? Can you explain what the differences are, Ray? You can't spell Guardiola, but I'm sure you can tell us all about his tactics. Anon, that would be the Nico who's been known throughout his career for scoring long-distance screamers? Why go to the games if you "agree with (Celtic legend) Sutton"? The boos at the end of the game were a disgrace, and most of you's have not changed one iota from the days when we expected to beat everyone. Give Warburton a break. You all agree that the likes of Windass, Forrester, Waghorn, MoH, Rossiter, Holt and Dodoo are good players...these guys were brought in for PEANUTS and most will be sold on for multi-millions. You can add Atakayi to that list...he will tear up the Premiership before the season is out. Barry McKay would have been released had Warburton not taken over. Are these things nothing to feel grateful for? Promotion last year, nothing to feel grateful for? I hear people talk about our record from towards the end of last season until now. Last season was LAST season...we have 11 new players now. 6 games gone, but most (if not all) of these players have not played every game. I know whining is our real national sport, but jesus.. The sad truth is that the group of players are just not good enough. True more can be given by some but u cannot build a team to challenge for a title or euro places on free transfers. I fear it will take 2/3 years to challenge for a title but mr king must invest or find others who will. Sad but true. last week i said we need legs in midfield and pointed to a 4 sitting in there of Windass, Halliday, Holt and Forrester... we got the first three of them today and played a lot better start Forrester on the left along with Halliday Holt and Windass and we will get fight and energy nxt weekend at the sheep. Furthermore please gonni give O'H a start? Tavernier, McKay and Waghorn all trundle the ball in to our striker's position and are constantly crowding him out. Drop the three of them. Why continue to do it? It has been the same failed playbook for months. Trying to think how many shots at goal Garner has had in two games. I think it was one, from 50 yards. He couldn't see the goalmouth, it was crowded with his own wingers and fullbacks. Mckay and Waghorn are not doing it on the wings. Dodoo and MOH should be given their chance with Windass and Garner running in on crossballs. The way we play now they arrive far too early, are static and have a posse surrounding them. But don't hold your breath for a change in tactics, it isn't an option. Totally agree rangers get the ball around the opositions box then stop to have a wee loom at what's gonna happen next. And the defence is tighter than a.ducks arse by that point. Too many players not good enough for SPL imo. Step up or sit down. One of the best posts I've read for a while Alex McC. Why did warbs sign Joe garner ? The boys shout for crosses to attack all day long today ,I only seen one decent ball played to him today and not in air ,he's a target man ffs but no were under orders strickly tippy tappy thousand touch no penetration football which the players are simply not good enough for at this level ,so much wrong at moment from the managers arrogant aproach to his system to players like McKay under performing ,walter smith changed thhe team every time he had play a formidable foe he cared about rangers winning more than his principles of how the game should be played ,here endith the lesson ! Early days. Mackay is overrated but young. Top 3 this year and good investments in January and next summer. We expect too much. It's work in progress. Imagine April last year. Then we would have taken where we are today. Listen mate, McKay is overrated, end of. He has no heart and will not physically apply himself. The physical part is part of any game in any league in the world and he is absent. Sorry to say, this WAS a work in progress, but it's been a work in stagantion for almost a year now and it's the coaching that is obviously the fault. No matter what the score 1-0 or 5-0 we should've won today! The trouble is we don't have the 'Rangers' mentality yet. I seen it in the early stages of last season going on a winning run and scoring goals for fun, Oduwa brought the much needed flair and even we loved it. We need a settled starting line up that can understand each other... the more we chop and change the less we solidify as a team. It's not good, but it's not the end of the world. We were not beaten. Why does everyone keep saying it was the best performance all season? It was slow, the passing was loose and often wayward and there was 1 bit of excitement when windass was through on goal and missed. I watched wallace (the captain) play poorly, mckay couldn't run or pass the ball and at some points. Also I couldn't tell who played where as they were all over the place in midfield. The gaffer is obviously warping the perceptions of the game before he drops barton for breach of contract, cos that was a poor lacklustre performance. Sorry but warbs hasn't got it. Squad rotation and the inability to hook a player like mckay who's played poorly All season is hurting the team. We can kick barton out for moaning but we can't drop a player and ask him to sort his head for stinking for 6 games. This season stinks of the Le Guen era good intentions but it won't work when ross county are time wasting from kickoff. Scottish football is what it is but we can't even beat timewasters. Agree by saying we showed a bit more tenacity in our game and actually created a few chances on another day might have gone in. Clint Hill did what he had to do and seemed to tighten up the centre of defence, Wilson is too slow and not forwarding thinking enough, I would either go with senderos(know he had a mad moment last week) or crooks along side hill, mckay is looking down in confidence, late attempted ball into the box showed that, bring in either o, halloran or forrester and keep our strikers, garner and waghorn in the middle where hopefully we can get balls into the box for them. My starting eleven would come from these guys -foderingham, tavernier, hill, senderos/crooks, wallace, halliday/rossiter, holt, windass, waghorn, garner, forrester/ohalloran.Then again just my opinoin and plenty others will have own ideas. We will come good of that I have no doubts. One....there is nothing progessive about dropping points at home to Ross County. Two.....there will be no investment in the next 2 transfer windows because there is no money. When will that penny drop with our support. King has conned the majority just as Whyte and Green did. Three.........Barton has sussed that Warburton is way out of his depth and given some of the garbage being spouted by the manager even the support is losing faith. You don't come out after a nil nil home draw and tell the world that the display was the best 90 minutes of the season. Four......if someone has to go it should be the manager and the job should be given to Joey as player manager, he would soon sort out the slackers. Best 90 minutes of the season........aye Mark I'm over the moon. League challenge over in the middle of September and with away games to Aberdeen, Hearts and ICT to come we will be lucky to be in the top 6 with a wages budget bigger than the rest of the league put together with the exception of the Tims who will stroll to 10 IAR! Can we score from a corner or wide free kick. Not usually as our team is abysmal in the air so again the set piece is played short or low. But with most of our opponents camped in their own box it is easy for them to deal with. A corner or wide free kick to Rangers doesn't make me excited to think a goal may follow the way it used to under Smith's teams etc. I remember the UEFA Cup Final...where we played the most embarrassing football ever seen in a European final. I wouldn't want a return to that bro. Neither would I but why deny yourself options when it comes to scoring goals?? 4 wins in the last 15 league games! that was 1 point gained under MW. that would be 2 points dropped under Walter. That's the difference. We need to bring back Walter with Mcinnes as assistant. they would whip the bears into shape in no time. It's the only option to restore us to where we belong. Dont like saying it but arbs has to go, he's not the answer. On 14th of June last year we had half a demoralised squad, didn't have a team and didn't have a manager. W&W performed minor miracles; recruitment, style of play, won the league, beat Celtic and almost won the Scottish Cup. Just over a year later and they have recruited another 11 players (with a tiny transfer budget) to compete with bigger and better quality competition. So by any objective measure of progress, the first 15 months have been very successful. They have one major issue to manage and they have made (just) two mistakes in addressing it; managing unrealistic expectation and bringing two very un-W&W players to help them meet it - Kranjcar and Barton. However, Barton's now on the way out and Kranjcar will be used only as a second half substitute impact player unless he can prove that he can significantly speed up (which i doubt he can). So back to last year's successful style of play, with an improved calibre of squad; Rossiter, Windass, Garner, Crooks joining fit-again Holt, Forrester and Waghorn. They will not win the league this year. They might not even finish second. And they will not win the league in 2017 either. But by June 2017 they will be getting close to mounting a proper challenge to Celtic, only 24 months after starting pretty much from scratch.